NICE AND EASY: Can you use crimp-on connectors for a cell booster cable? We recommend compression connectors for all coaxial cables, but mostly because they offer superior weather resistance. 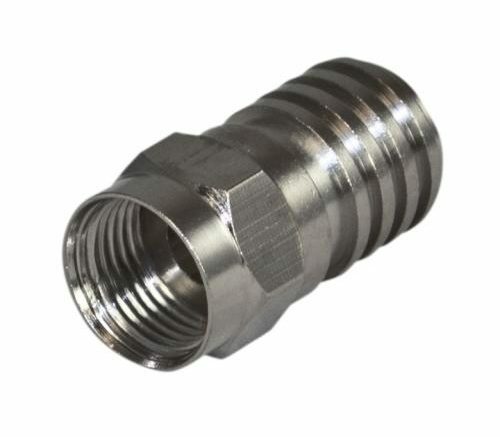 A compression connector is mandatory for satellite because of the dense, high bandwidth signal that passes through it, but cell signals do quite well with crimped-on connectors on cables. If you’re trying to use up some old cables or are just looking for an inexpensive way to extend a line, cables with crimp-on connectors are just fine for cellular, unless they will be exposed to the elements. It’s very hard to get a hex crimped connector to be as waterproof as a compression connector, and even with the right weather boots, water can still get in and corrode the cable itself. Hex crimped connectors on cables are also just fine for antenna lines inside the house. If your home was wired for cable TV in the 20th century it probably has hex-crimped connectors throughout. These won’t help you for satellite, that’s for sure, but you have a built-in distribution system for your antenna if you want to go that direction.